Manufacturing Month kicked off in Montgomery with local students getting introduced to Hyundai Motor Manufacturing facility and Hyundai Power Transformers. 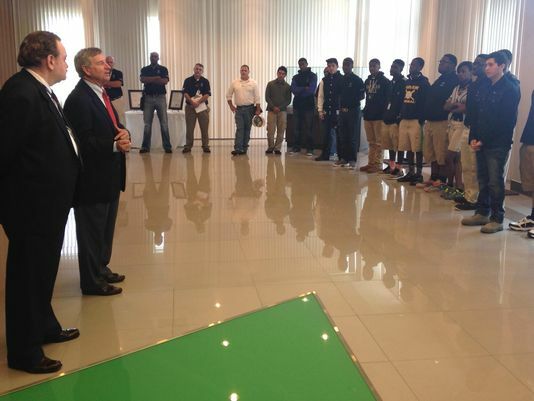 Two separate groups of students from Montgomery Preparatory Academy for Career Technologies (MPACT) were each taken to one of the two facilities Friday. There, students such as 12th grader Zakia Muhammad were shown the possible careers available to them. Zakia has already decided her path past high school. She will attend Auburn University - Montgomery and wants to be a nurse. For her classmates that don’t have an idea of what career to pursue yet, Zakia said the visit was a “cool” experience. Most young students hear about jobs, but it is often difficult to imagine the day-to-day life of working those jobs. By touring the facility, MPACT students were able to form a concrete idea about a viable, local career option at Hyundai’s manufacturing facilities. Mayor Todd Strange and County Commission Chairman Elton Dean were on hand to sign a proclamation officially making October Manufacturing Month with Friday being Manufacturing Day. After, Strange spoke with the students about the career opportunities available at Hyundai. The tour was especially relevant following reports over the summer that Hyundai did not see Montgomery as a suitable source of trained employees. By introducing students to the plant at an early age, the city is hoping to grow the local work force. Montgomery Public Schools Career Tech Director Cindy Veazey says it also supplements the lessons learned in the classroom. The idea was a collaboration between the Chamber of Commerce, Alabama Technology Network and Alabama Industrial Development Training. The Chamber of Commerce then approached Veazey with the idea, and the MPS saw it as an opportunity to provide the students with important information. Veazey said the most important lesson for the students to learn is that they have choices.